A recent editorial suggested that the 2012 allowable catch of 400,000 harp seals in Canada is unlikely to be reached because of the lack of markets for seal products. This may well be true, and we are thrilled to say that thanks to your support, the International Fund for Animal Welfare’s work on the European Union and Russian bans on seal products has all but destroyed the global markets for seal fur. The editorial then goes on to claim that because the quota was not likely to be reached, that we should do away with having a quota altogether. To suggest that the harp seal quota is irrelevant because it is not likely to be taken is as ludicrous as saying that we should not bother trying to manage fisheries at all. 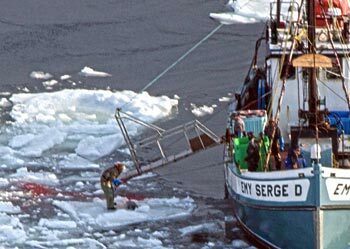 While IFAW has concerns about the management of the Atlantic seal hunt, it is one of the few “fisheries“ in Canada where a management framework has been put in place, and it has been promoted internationally as an example of “responsible management”. Although it falls short as a Precautionary Approach, the framework provides a quantitative reference point for the population, and outlines that quotas are to be set with the objective of keeping the population above this point. An expert panel report of the Royal Society of Canada concluded earlier this year that Canada has failed miserably in fulfilling national and international obligations to sustain marine biodiversity, and that the Minister of Fisheries and Oceans wields too much discretionary power. There is no better example of this abuse of power than Fisheries Minister Ashfield’s decision to set the harp seal quota at 400,000 - against the advice from Departmental and international scientists that any quota over 300,000 would not respect the management objectives for this population. By showing a continued disregard for fisheries science, and a refusal to commit to management plans that have been established, it is clear that the Canadian government has learned nothing from the collapse of cod stocks and is once again heading down the dangerous path of putting politics ahead of fisheries science. The fact that the harp seal herd is in decline is no reason to rejoice. On the contrary, harp seals are likely to face increased climate-related threats in the future, and this is all the more reason why commercial exploitation should cease. Send a message to the government of Canada that it is time for the seal hunt to end.